South Asian Author Challenge – my books. my life. I also want to read something by Salman Rushdie and at this moment I’m thinking it might be Midnight’s Children. So that leaves me with one more. If you have a favorite South Asian author or book, let me know in the comments. I’m also trying to get Ben to join because he loves South Asian literature as well. And I’m hoping he can guest blog for his reviews. Next Article I’m curious: when do you read? I’d love a new camera for Christmas too!! I may have to add White Tiger to my list if I get through the others. I’ve heard so many good things about it. 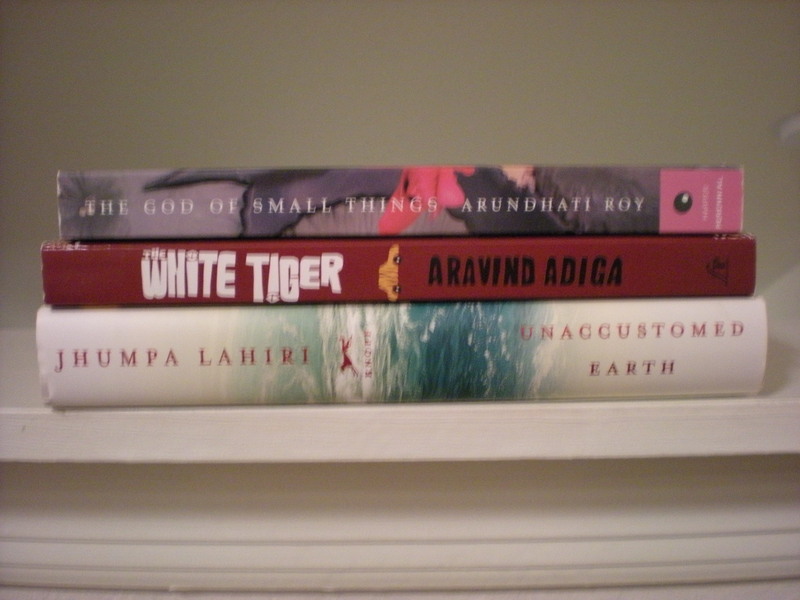 White Tiger has been on my TBR list for a long time. I’m glad this will force me to finally get to it. I really enjoyed “White Tiger” and “Unaccustomed Earth.” I also joined at the 5 book level because I’m afraid I might join too many challenges next year. I know. The challenges are fun and I could see myself joining way more than I could ever possibly do. I’m trying to be frugal. That might count. I’m not entirely sure. I think it’s written by South Asians and having something to do with South Asia. It might not be the camera. I find books to be hard to photograph too. Yes, but I find everything hard to photograph so I think it’s the camera. That was taken with the macro setting. I tried all combinations of flash and macro and that is the best one (macro/no flash). I don’t know if it’s me or the camera. This is an interesting challenge and quite tempting! I found all the books in your list quite wonderful! They are all there on my ‘TBR’ list, but I haven’t read them yet. One book I would like to explore (if I participate in the challenge) is ‘Basti’ by Intizar Husain. (You can read a chapter at http://www.columbia.edu/itc/mealac/pritchett/00litlinks/basti/index.html) and see whether you like it). Pingback: The Writing on My Forehead [Book Review] - my books. my life.